$500 to $5,000 grants to small and mid-sized presenting organizations in Delaware, the District of Columbia, and the U.S. Virgin Islands. Up to $50,000 to support documentary films that focus on current human rights issues, freedom of expression, social justice, civil liberties, and related issues. Community Classes at the Centre are donation-based, and every cent goes to support those in need: 'Families for Children' is a not-for-profit agency that cares for over 600 destitute and mentally challenged children and women in India and Bangladesh. The organization is run entirely by volunteers from their own homes, so the money goes directly to the orphanages and schools that they have set up. The Centre de Yoga du Marais and its teachers have been supporting this organization for several years through regular and ongoing Karma Yoga practice. Reservation encouraged, but not required. There was a man who, not so long ago, stepped out of his house into his garden at that magical time when light and shadow meet and merge, when night and day are for a moment one, and the air is quiet and full with its secrets. Photo © Ann Moradian 2012. The man breathed in the moist air deeply, and widened his eyes to take in the beauty of the leaves and flowers and grass in his half lit garden. As he gazed across it all, his eyes came upon the coiled form of a snake. Now snakes come in all kinds, but in India it is often the deadly cobra that makes its home in such quiet gardens. The man cried out in fear and panic "Snake! Snake!" trusting the night watchman to come with his pronged stick and thrust the poisonous creature into the fields or out into the river, far from the idyllic home he had worked so hard to build. The old man came with his nightstick and his lamp and, as he moved closer to trap the snake's neck in the fork of his staff, the light revealed a coiled rope that must have been left out that night by the new gardener. The two men had a good laugh! In another version, the old man has fallen asleep in his chair and his lamp has gone dim. The man pushes the old man aside as he rushes in to kill the snake. Only after he has exercised all his adrenalin destroying the thing does he realize it is only a rope. And it is only then as he turns, slightly abashed, toward the fallen elder that the man realizes the old man is dead beside him, his neck broken from the violence of the fall. Swami Satchidananda says that this time of "twilight is the most dangerous time," because in the full light of day we can see clearly what is there, and in the dark of night we see nothing. But when the light and dark meet in that half-light of either dawn or dusk, it is then that we can confuse a misplaced rope and a deadly snake. He goes on to say that Yoga is neither for the enlightened nor for the ignorant, but for those in between, to dispel ignorance and to refine our discernment. Kresge Foundation Invites Preliminary Applications for Arts and Community Building and Artists' Skills and Resources Grant Opportunities. Theatre Communications Group Announces New Leadership Program for Theatre Practitioners. Breakthroughs in Gerontology Initiative Invites Proposals for Research Into Biology of Aging. Two-year awards of up to $200,000 each for pilot programs leading to transformational discoveries in the fundamental biology of aging. The large metal door opens by itself so slowly I have to slow the city rush in me to wait. But it is worth it. Paris is full of magical courtyards, and this one feels like entering an old country village with its cobblestone and moss. It feels ancient in contrast to the urban press of the highrises that make up the 20th arrondisement. 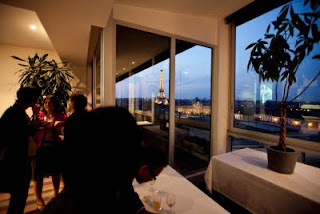 The studio theatre here at Le Regard du Cygne seats just over 50 people. Indian summer fled last week so we were happy to gather in the small gallery splashed with abstract grays and yellows. © Le Regard du Cygne. All rights reserved. The premiere of Christina Towle's AIRTIGHT begins with the sound of her breath as she blows up a very large white balloon. She fills it completely -- you can't help but wonder if it will pop -- and when she is done, she lets it go. We see it, hear it and feel it expire as the air leaves. All of that breath becoming nothing but the limp shell of the thing-- death and the life that was. 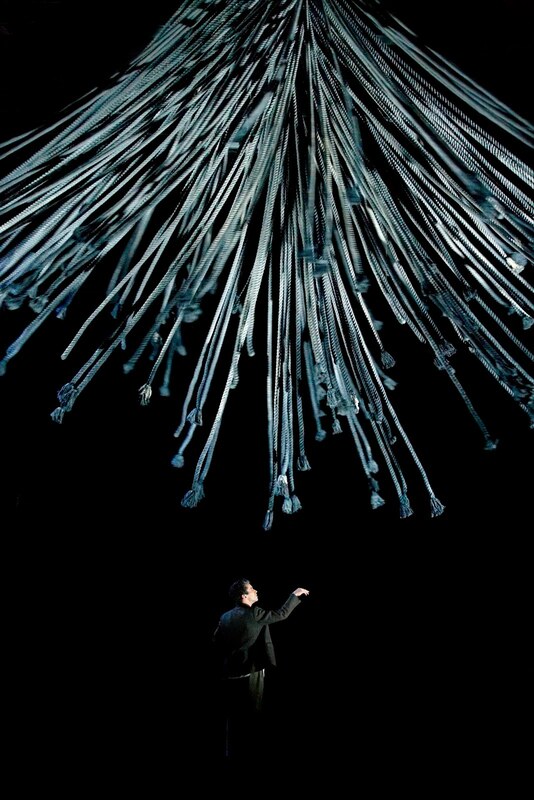 The entire piece is made up of the sound and the movement of Towle's breath and the balloons. She is focused almost entirely on the torso, the lungs and the abdomen, leaving the limbs inarticulate. I don't see it as dance but, rather, conceptual art expressed through the medium of the body. She ends standing on her head with the declaration "I am here." One of her airtight balloons has popped. Orin Camus begins his solo, Circle Moods, standing on his head. Well, that's not entirely true. There was a long stretch where I was thoroughly entranced by the minute movements of the fingers of his right hand. His body is more like an athlete's than a dancer's, and it moves from one incredible contortion to another. He has the same sense of sculptural form, sensuality and power that we see in Rodin's work. The quality of his transitions and timing are so deeply imbedded and his body is so strong that it feels like we are watching living, breathing, feeling sculpture that is made of bronze, not flesh. Video images by Mikael Arnal are projected directly downward into the circle of light that is the work's central space, creating shadows of wafting smoke or a pool of blood that rings outward when Camus lands in it in a full bodied splat. The rough edges of the street keep pulsing through the work. This is dance as visual and visceral urban poetry. In this work the city is not only Inescapable, it is in our blood. I attended a performance of the Slovakian Ballet at the State Theatre in Bratislava 18 years ago. It was an unforgettable experience. The dance actually began as the conductor raised his baton. There was a very long pause in which you could savor and actually rest in the tangible silence that proceeds sound. The orchestra, the conductor and the audience together were suspended in that long moment, tasting the delicate birth of music. I will never hear music the same way again. And, after seeing Jaro Vinarksy's 'The Last Step Before' I will never see light in the same way again. We are in the dark long enough for our eyes to adjust and register how deep it goes. When light comes, it comes slowly, floating red in space. It begins to register as body parts and their disappearance, like a slow motion strobe light. The images change from one space to another so sharply, and with such sculptural variation that it seems physically impossible. As the light strengthens, the body parts merge into a single moving body that seems to float, suspended in the dark velvety space. It is only later, watching what looks like a glowing head bobbing on the surface of this black ocean, that I consciously recognize darkness as its own tangible entity. Vinarsky is an incredible dancer. He unites breath, being, form and movement in a way that resonates as texture, vibration, memory, and feeling. I am moved deep within my being. But the brilliance of the collaboration between Vinarsky's choreography, Pavel Kotlik's lighting and Ondrej Bederka and Mirek Zitnik's costume cannot be ignored. 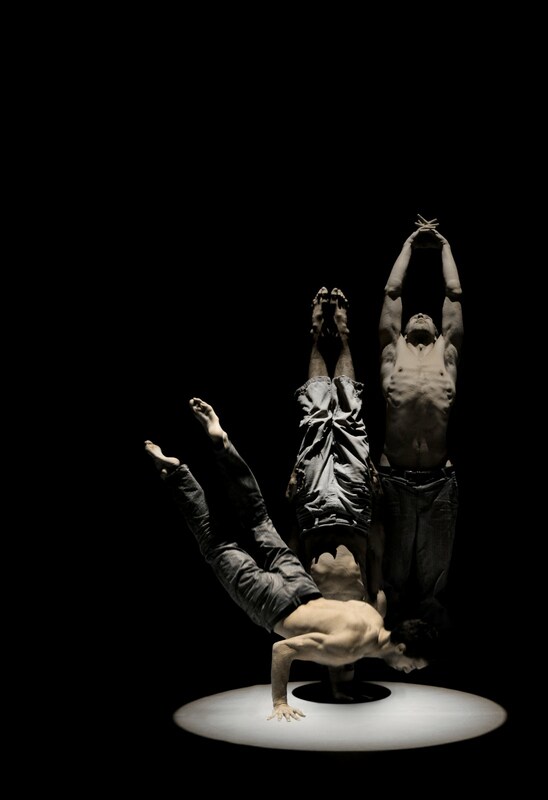 It transforms the dance into an extraordinary visual and visceral experience. The program notes tell us 'The Last Step Before' is "a story where one of many human beings attempts to fly." It refers to the character as "our hero" (I hate heroes! I even hate the “idea” of heroes.) To me, they imply a glamorization of struggle that I find self-aggrandizing and infantile -- blatantly false. But this hero is tenderly loved by his creator. This hero is so honest, sincere and vulnerable that he cuts through even my entrenched aversion. The second work on the program was by Eva Klimackova, another Slovakian, whose company, E7Ka, is based in Paris. I was curious to see her work because I had the pleasure of moving with her at a workshop that Bill Young conducted at Canaldanse here last spring. I will not forget the extraordinary sensitivity, depth and honesty I felt in her dancing. Klimackova's quartet, TOUCH.ED, was performed by Klimakova, Tomas Nepsinsky, Sylvain Rembert and Marika Rizzi. The dancers were costumed in blacks and blues that merged into the dark canvas of the theatre. The lighting by Alexandrine Daloiso and Philippe Deutsch seemed to flatten them further into the shadows. I recognize the choice of a casual performance aesthetic as a valid cultural expression, but was disappointed to feel so alienated from them. The audience, overall, was enthusiastic and responded warmly to Klimackova's piece. Dark costumes against a dark backdrop with dark lighting didn't help me, with my failing eyesight and late night fatigue, to connect with the work. The dancers' casual energy came across to me as non-committal and without purpose. I didn't understand why I should care. Partnering that may feel strongly connected for the people doing it doesn't automatically transfer to performance. A French woman I spoke to on the metro ride home who had also seen the program described the dance as "delicate" and clearly appreciated it. I am glad the delicacy that I know is inherent in Klimackova's touch and in her partnering was communicated to others, though I am sorry it wasn't to me. 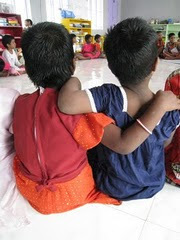 Community Classes at the Centre are donation-based, and every cent goes to support those in need: 'Families for Children' is a not-for-profit agency that cares for over 600 destitute and mentally challenged children and women in India and Bangladesh. The organization is run entirely by volunteers from their own homes, so the money goes directly to the orphanages and schools that they have set up. 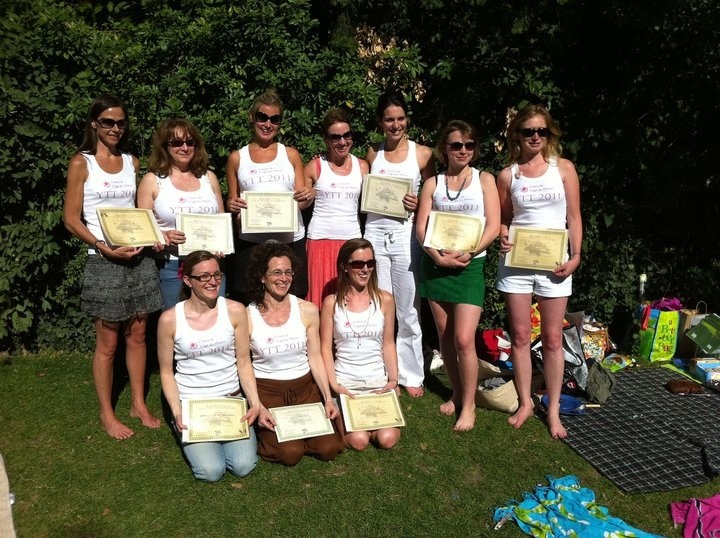 The Centre de Yoga du Marais and its teachers have been supporting this organization for several years through regular and ongoing karma yoga. Reservation suggested but not required. All levels welcome! *UPDATE for October 2011: We'll all be heading over to the Champs de Mars in Paris to join in a giant gathering of Yogis in White (to sign up, click here). If it rains we'll have community class at the Centre. Kathy Wildberger talks about her work with Jeff Duncan (the founder of Dance Theatre Workshop) on this video interview by Christine Jowers of The Dance Enthusiast. Weekend workshops introducing PranaStretch and Soul/Pas Seul will be held throughout the year. Details TBA. Private Classes can be scheduled by contacting Ann Moradian directly at pranastretch@yahoo.com or 06 89 70 23 58. To see information on RATES, click here. Photo of Ann Moradian in "Treelife." © Marty Tharp. All rights reserved. James Thiérrée and Kaori Ito. Photo © Jean-Louis Fernandez. The first time I saw James Thiérrée's work a few years ago, I saw the production called "Bright Abyss," which left an unforgettable and thoroughly indescribable scent of a memory. I was and am still speechless. 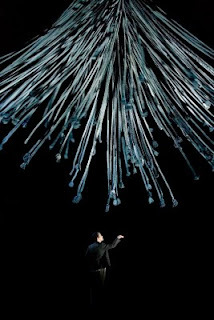 Not because of the performers' flying feats, which are truly impressive, but because of Thiérrée's ability as a director to measure, with elegance and precision, the balance between circus and physical poetry. It is a beautiful balance because it allows us to laugh and to be touched deeply, while setting the mind a-wander in an intangible realm that cannot be named or held. We cannot know what we have seen, we can only experience it. If we are lucky, it leaves a scent. This season, I went to Thiérrée's production of "Au Revoir Parapluie" two times. I wasn't sure when I saw it the first time if Thiérrée had drifted off, out of his intangible universe into the realm of pure circus or not. I wanted to see if I had missed something. There are threads that bind a work together and give it coherence. Perhaps these threads are simply the trail left by the creator's mind at work in the material, his or her questions and intent. For me, as a viewer, these intangible threads matter. Where they are cut and abandoned, the work begins to fray, and our minds fray a bit along with them. On first viewing, the array of effervescent vingnettes (each complete in itself and thoroughly satisfying) overwhelmed the overall work. I could only hold isolated bits in memory, and was left with no sense of the piece as a whole. I felt as if I had seen a great smattering of brilliant stars in the deep night sky, but was missing the one or two that would offer me the pleasure of believing I had discovered a constellation in their midst. I am glad I saw it again. In all of the rich and joyous phflash, twist and swish, the more subtle workings began to reveal themselves, exposing not only their threads, but also the beauty, mystery and tragedy of life, its chaos and contradictions, its returning themes, and momentary lunacies... its poetry. Where I had feared Thiérrée had lost his Muse, I found instead that he was sharing her with us in the form of Maria Sendow who, like a metamorphing Virigil seems to guide Thiérrée's Dante-like character through the deep and buried layers of memory and mind. Her rich and powerful voice returned again and again, not only invoking her version of the story, but also bringing Thiérrée's character back to the thread he began with -- the story he silently sings us, in pure and accompanied mime, of his beloved and no longer present wife and child (or is it his dog?). We feel his yearning, his deep attachment, not to the actual beings they are, but to who he believes they were, how he believes they were, and what they meant to him. And can we ever really do better than that? Can we ever really know anyone, no matter how close or dear? Or do we really only ever know our perception of them? Magnus Jakobsson, Kaori Ito, James Thiérrée and Satchie Noro. I can't write about the work without mentioning how delightful the use of music was throughout, despite what was often (and perhaps intentionally) poor quality recordings. When Sendow rises out of a great black sea of fabric she passes a precious ball of nothing into Thiérrée's carefully cupped hands. When opened, we hear his first quiet listening, like a child hearing the ocean in a conch shell that very first, most wondrous time. When eaten, we hear it buried deep within his belly. Thiérrée has carried the poignancy and humor of his grandfather, Charlie Chaplin, forward and into our times, challenging the edges of his art and uncovering new possibility. The performers are all excellent. The two female dancers, Kaori Ito and Satchie Noro, are both strange and beautiful -- hybrid creatures -- equally accomplished as dancers and acrobats, as comfortable upside down and sideways as traveling across the floor. Magnus Jakobsson, dressed in what looked to me like a variation on army fatigues, is full of life, humor and commitment in every moment (and I suspect on every night). In Jakobsson's mimed 'magic act,' you can't help but love his confusion whenever anything 'real' turns up. He is so satisfied with the imaginary world he is creating for us, and so disturbed when confronted by the tangible, like the actual cards in the 'card trick' that suddenly pop up, or the fake bird that plops heavily to the ground rather than flying gracefully off, or when he is overwhelmed by scarves that, in his mind, shouldn't really be there. Nor should the scissors be, which -- because they are -- pierce his heart and set it bleeding. This theme, we could call it something like 'the maze of the mind,' is reflected throughout the work in the form of the mistaken, the remembered, the wished for that imprints and overwrites the 'real' in our experience. Foreground James Thiérrée and Magnus Jakobsson, background Kaori Ito, Maria Sendow and Satchie Noro. Photo © Jean-Louis Fernandez. And on the subject of the grass -- tall dry stuff that swishes with the perfect sound of sabers as Thiérrée and Jakobsson duel -- I found myself lost here in the beauty of Thiérrée's 'juggling act' with one bundle of this grass. I found it the most beautiful moment of dance in the entire work. It is simply that. Juggling a single bunch of tall, dry, wheat colored grass. But done in such a way, becoming such pure expression of human movement, grace and feeling, that it becomes that thing that has no name and leaves its scent. It is done simply and sincerely and rings true in a way that imprints itself deeply in visceral memory. The work is so rich and so full, and there is so much I am not telling you about -- like how dreamlike (and how lifelike because of that) the work is. Like how painfully touching it is when Thiérrée recognizes in what is now a very long-legged bird creature, the very articulate foot of his daughter/dog (Kaori Ito), and in recognizing her, finding her again. So much love and loss and separation, like getting caught up in a huge tangle of ropes and viscera. And how the heart, after all, is still beating. Somewhere... still beating. And the silly angel lady -- our Muse once again, strutting about in a huge white skirt that flips and thwacks with each step -- insisting on a game of badminton. The birdies, like stars, like snow falling... like dust falling. Like the dust on that magic ball of sound that came out of his head, that was gifted in the beginning, forgotten, and found again after being lost in the journey through his body, through his life... Like the dust of the tree that covers the stage before we ever began. That ball of dust blowing away. Too many birdies to juggle, thudding down until they pound on the head, like heavy hail. The work is a battered and battering thing. And frayed, like life. James Thiérrée. Photo © Richard Haughton. With costumes by Victoria Thiérrée and Manon Gignoux, lighting by Jérôme Sabre, sound by Thomas Delot, the stage by Marc Moura and Léon Bony, props and wardrobe by Lilliane Hérin and the directing assistance of Sidonie Pigeon, this team works together with the performers to create a magical world we can enter into and lose our way in, very much like Jakobsson and Thierrée lose their way with the very precise series of directions that are so complicated they cannot be repeated, despite how clear and obvious they were when given the first time! Quel voyage magique! My mother made sure that my brothers and I did our fair share of the housework when we were growing up. I think this was as much to ensure that we would be able to take care of ourselves when we set out into the world, as it was to ensure that the house ran properly since she worked fulltime! Even with lots of practice and excellent training, I remember feeling slightly stunned when I was out on my own by how much time I had to spend doing things like the laundry. Clearly I had been living under a delusion that 'independence' would allow plenty of time to do whatever I wanted. The structure of life itself demands certain things to be sustained. On simply a physical level we need air, water and food cycling smoothly through the body on a regular basis, and we need an environment in which the body can maintain a temperature of approximately 98.5°F. These basic needs bring with them other requirements, like breathable air, clean water, the hunting, gathering or purchase of food and, in most regions of the world, shelter for at least certain times of the year. This all, in turn, requires... more than I had realized when I was 19! In asana practice (as in dance, sports, the martial arts...) it is not unheard of for injury to occur, especially when we are directing the body to do what the mind wants without tapping into the body's storehouse of information. Dukha (pain, discomfort, dis-ease) serves as a guide, teaching us to pay attention to the body's knowledge and creativity. It tells us not only what is comfortable or uncomfortable, but also what is constructive or destructive, inviting us to open to new possibility. The desires and fears of our ego-mind (ahamkara) are strong, persistant, and often very loud, like children clamouring for attention or wheedling for their way, and the body-mind (manas) speaks in a language we may have forgotten how to hear or understand. By allowing space within oneself for this conversation between mind and body, where we can hear, observe and measure, a space is created in which we can develop balance, steadiness and ease. With a certain amount of awareness, a great deal of rigor, and a deep breath of compassion we can usually find this place of sthira-sukham in even the most intense of postures or practices. Yoga asana are designed to work deep within the body, not only on a muscular and skeletal level, but deep within the connective tissue and in the cells themselves. This 'inner universe' holds within it not only immediate feedback, but also the residue of memories and emotions that lodge within the body. Maybe this a way to store information that the mind is not ready to handle on a conscious level. Maybe it is simply the trace life leaves – its imprint or mark. By listening to this inner universe we can discover what we need for our stability, strength and wholeness, what we can release, what we must release and where we can invest and direct our energy and attention. We can discover not only ease and strength in the body, but also clarity and calm in the mind. Like the body, it too experiences sukha, dukha and sthira. 'Pointing a Finger at Star Formation.' 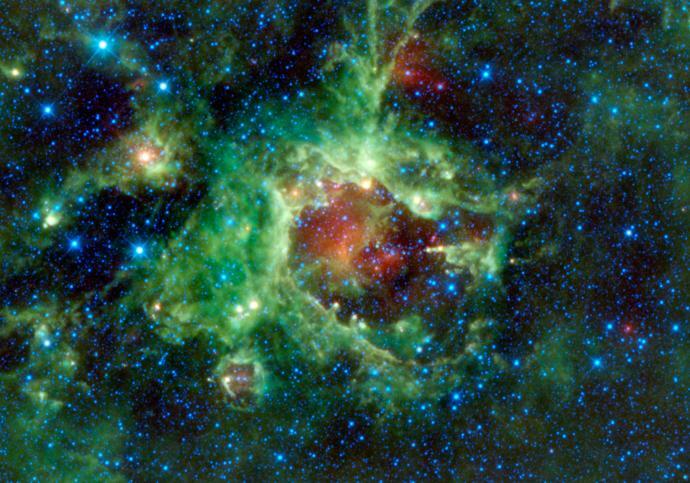 Photo © 2011.NASA/JPL-Caltech/UCLA. This relationship between sthira and sukham is reflected throughout our lives, on every level. Not only in our physical practice and personal lives, but also in larger organizational structures, like families, businesses, communities, governments and nations. The relationship between sthira and sukha is constantly at work, guided by dukha. Life itself presents the ongoing challenge and opportunity to find a balance between work and play, effort and release, strength and flexibility, stability and mobility, between responsibility and freedom. Between survival and annihilation. The unspoken and often forgotten element in this relationship is that of choice. 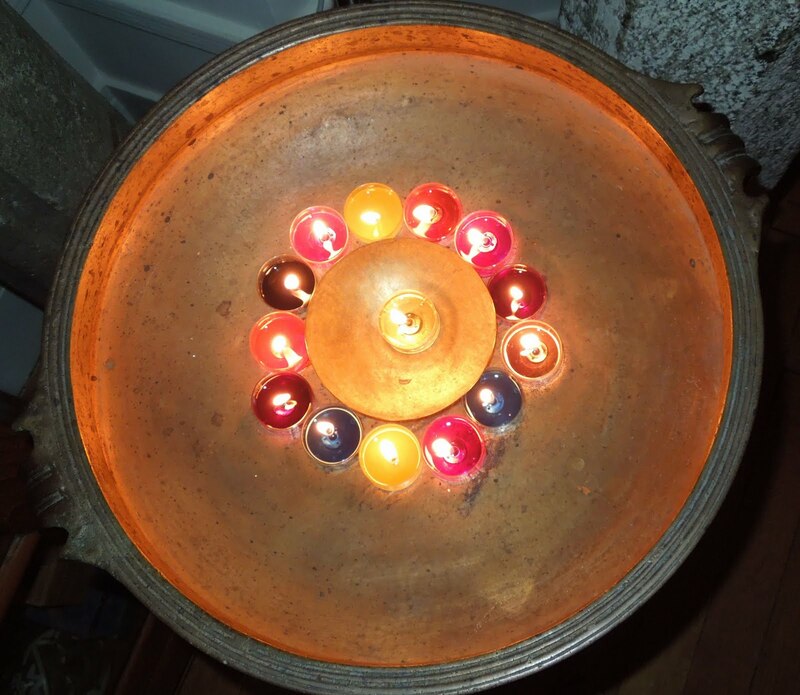 What do we do when confronted with dukha, with sukha, or sthira? Do we respond and adjust, sacrifice, ignore, cling, reject, deny, justify, blame, suffer, sleep? Marvelous, all the different choices we make. I like taking the issue of road maintenance as a simple example. Pothole in the New York/New Jersey Metropolitan area. Photo © 2010. Stefano Giovannini. New York, where I lived for many years, is full of potholes – deep dips or actual holes in the roads where ankles are twisted, cars are tossed off track, and entire body parts have been known to disappear, at least temporarily. The people who live here vote on how much and in what ways they choose to maintain their common roadways. For the most part, they prefer the discomfort and occasional risk to life, limb and wheel to the discomfort of paying the additional taxes to better maintain their roads. So, potholes abound! This is the choice these people have made, consistently, for many years. In Paris, on the other hand, people have a different response to the same question of how to maintain their roads. For these people, apparently, the discomfort, embarassment and risks caused by poorly maintained roads outweights the discomfort that might be caused by higher taxes. So, their roads are beautifully maintained and new systems are sometimes established to address future problems before they have become actualities. It costs. And this is their choice. This example is simplified, of course. There are many things at work, including a different relationship between the individual and the community, a different definition and sense of responsibility for the 'common good.' The two cultures are intrinsically different on many levels, but I hope you get the basic idea. Essentially, we find our rhythm and make our choices within the constraints we are confronted with, and our perception of them. And hopefully we find within the parameters we set at least fleeting moments of satisfaction – time outside the loads of laundry and maintenance to play a little. 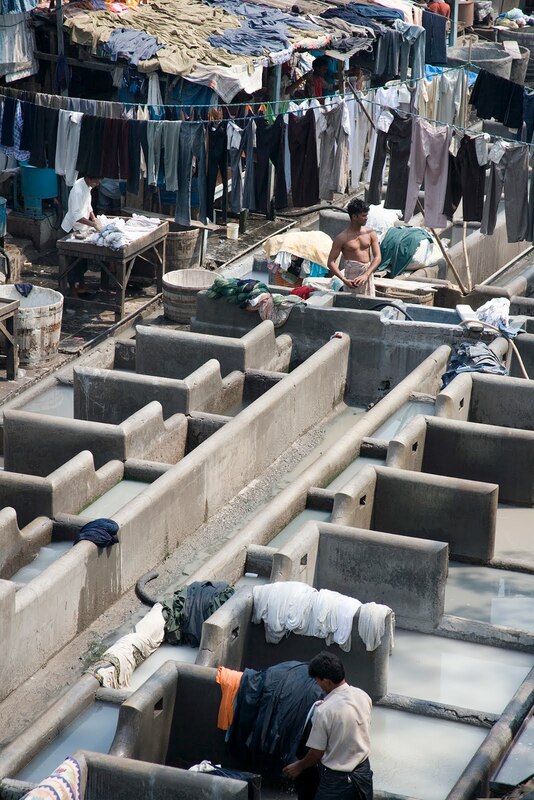 Better still (if anyone is feeling ambitious), if we can find sweetness and pleasure in doing the laundry! I wonder if we can't assess our progress, our development, by how we respond in a crisis. Who are we and how do we choose to respond not only each day – and certainly each day – but also on our worst day, in the midst of our most fearsome challenge? How does a warrior meet weakness? How does a dancer respond to a broken body? How does a scientist manage the madness of his mind? How does a monk who has spent his entire life dedicated to non-attachment fight for his life? How do we choose to respond to the challenges we meet? Not only is choice an important element, it is a critical one in which we take part in shaping our lives and the world around us. After far too many years. International Dance Day was established in 1982 by the International Dance Committee of the International Theatre Institute of UNESCO. They, along with dancers and dance lovers around the world, have been celebrating on or around the 29th of April every year since. 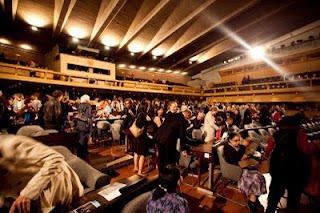 It has come a very long way from the intrepid expeditions in UNESCO's hallowed hallways, guerilla-style at noon, that I first attended a number of years ago. (Think 'tile-on-concrete,' dancers!) I am delighted to say that this ITI celebration has become an event not to be missed. Each year, the dance committee invites a prominent dance artist to speak on behalf of dance. This year the author was the Belgian choreographer and dancer Anne Teresa De Keersmaeker. I am sure I was not the only one who appreciated her honesty in saying that she is not "busy about meaning," despite the fact that the first question people often ask about dance is "What does it mean?" For her it isn't about translating meaning because, she says, there are things that dance can embody and express that are not nameable. We had the opportunity to see her perform Part 3 of Fase (a four-part work to the music of Steve Reich, created in 1983), which is an excellent example this. The base phrase in this section of the work, as in the music it is choreographed to, is repeated again and again and again, with small variations that accumulate over time to add up to a powerful transformation of the work from beginning to end. You can't really put words to those kind of subtle, and very abstract variations in energy, angle and intent that change our experience as viewers entirely. And that is, indeed, one powerful and curious aspect of what dance can and sometimes does do. 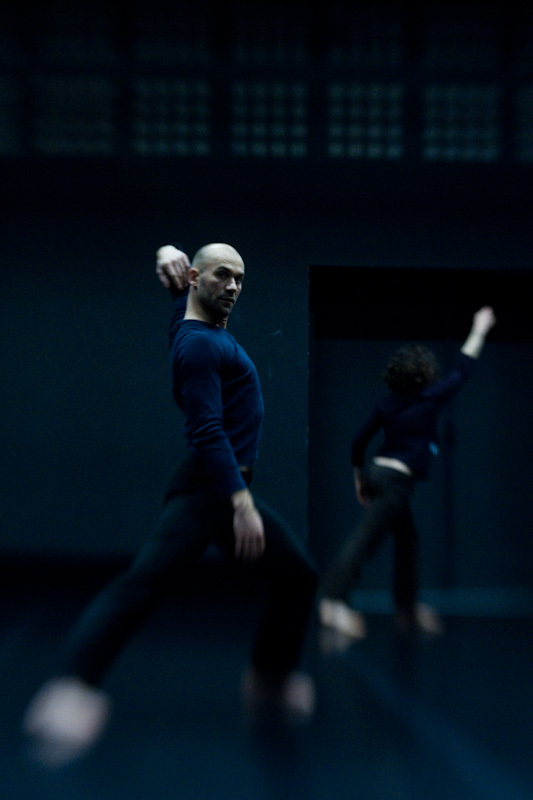 A section from Thierry De Mey's film of De Keersmaeker's Rosas danst Rosas was also presented. I suspect it would be very unusual not to respond viscerally to De Mey's dance films. His lighting, footage, editing and music choices are merged with actual sound in such a way that we feel it in our skin -- we are there, and we are that. I find this Belgian composer, director and filmmaker to be a choreographer in his own right, and was sorry not to see more of his work on this program. I appreciated the quiet connection between Salva Sanchis and his collaborator, pianist-composer Kris Defoort in their improvisational work, Action. I found the quality of Sanchis dancing honest, sincere and organic. Frontier Danceland, the group of young dancers from Singapore, were beautiful movers in Albert Tiong's work Second Chance. I was impressed with how effective their lighting was, creating beautiful pools and shadows, especially knowing that their tech was set and run only briefly that afternoon. And that leads me to what I really want to talk about here, which is all the people you don't see and often don't even hear about when you go to a live performance: The lighting and technical staff, for example; the rehearsal directors and teachers who have dedicated their lives to training the next generation of artists; the staff of ITI and its Dance Committee members who have, year after year, decided that dance matters; World Dance Alliance, and World Dance Alliance Europe which collaborates with ITI on this event each year; the Permanent Delegation of Belgium to UNESCO; the Flemish Government and the National Arts Council Singapore; and those who are no longer with us but have carved out a path for us, like Ilona Copen who was a driving force for the creation of this and many other dance organizations and events. These are "dance enthusiasts" of the most dedicated and modest variety, and it is good to remember them from time to time, and thank them for keeping dance (even if it isn't 'busy about meaning') in our world. "I think dance celebrates what makes us human. When we dance we use, in a very natural way, the mechanics of our body and all our senses to express joy, sadness, the things we care about. People have always danced to celebrate the crucial moments of life and our bodies carry the memory of all the possible human experiences. We can dance alone and we can dance together. We can share what makes us the same, what makes us different from each other. For me dancing is a way of thinking. 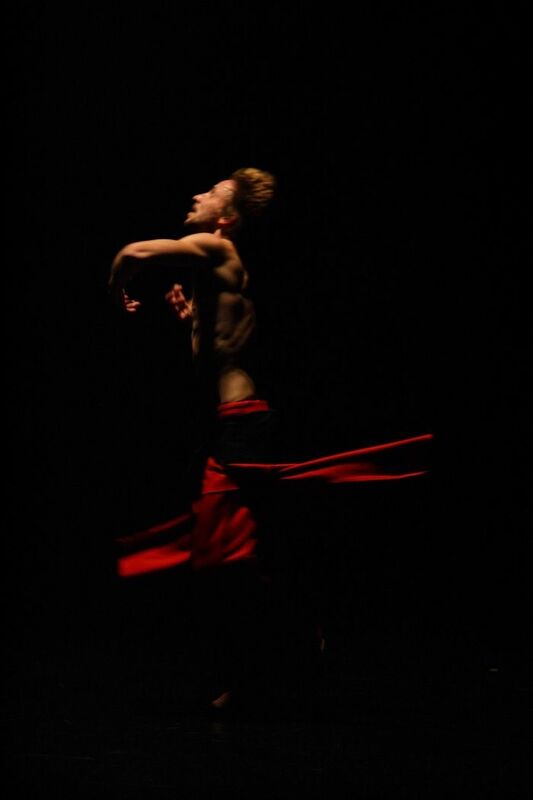 Through dance we can embody the most abstract ideas and thus reveal what we cannot see, what we cannot name. We carry the world in our bodies. I think that ultimately each dance is part of a larger whole, a dance that has no beginning and no end." 8. Health and well-being…nearly one-half of the nation’s healthcare institutions provide arts programming for patients, families, and even staff. 78 percent deliver these programs because of their healing benefits to patients—shorter hospital stays, better pain management, and less medication. 5. Arts in the schools = better SAT scores…students with four years of arts or music in high school average 100 points better on their SAT scores than students with one-half year or less. Better scores are found in all three portions of the test: math, reading, and writing. 3. Arts are the cornerstone of tourism…arts travelers are ideal tourists—they stay longer and spend more. The U.S. Department of Commerce reports that the percentage of international travelers including arts and culture events during their stay has increased annually the last six years. 2. Arts are good for local merchants…the typical arts attendee spends $27.79 per person, per event, not including the cost of admission on items such as meals, parking, shopping, and babysitters. Non-local arts audiences (who live outside the county) spend nearly twice as much as local arts attendees ($40.19 compared to $19.53)—valuable revenue for local businesses and the community. 1. The arts are an Industry…arts organizations are responsible businesses, employers, and consumers. 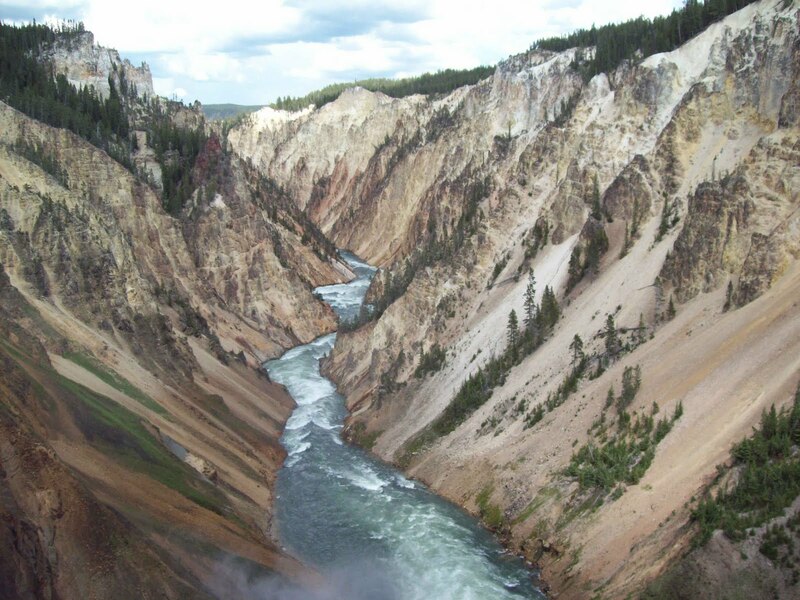 They spend money locally, generate government revenue, and are a cornerstone of tourism and economic development. Nonprofit arts organizations generate $166 billion in economic activity annually, supporting 5.7 million jobs and generating nearly $30 billion in government revenue. Investment in the arts supports jobs, generates tax revenues, and advances our creativity-based economy. If he asked for 11 reasons . . . what would you have added? Equal Rights for Nature in Bolivia! In honor of Earth Day, I am grateful for the indigenous voices of Bolivia speaking out so clearly and steadfastly. 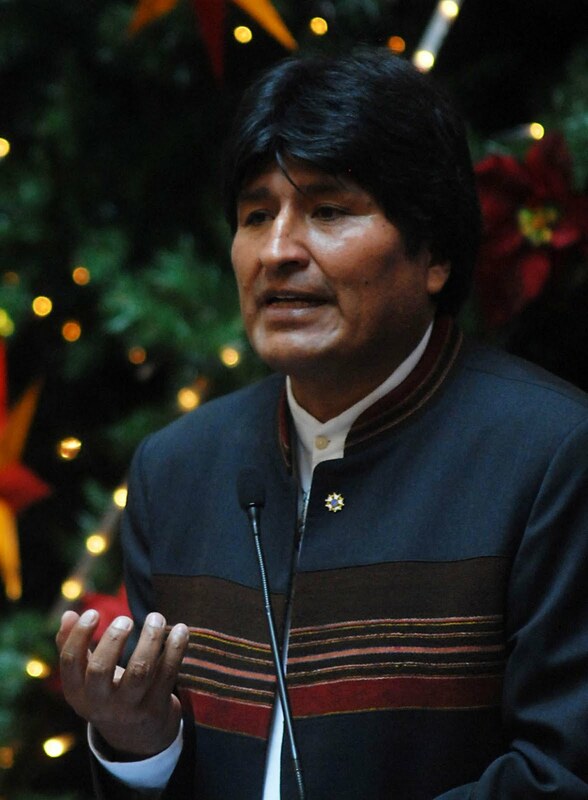 "Bolivia is set to pass the world's first laws granting all nature equal rights to humans. 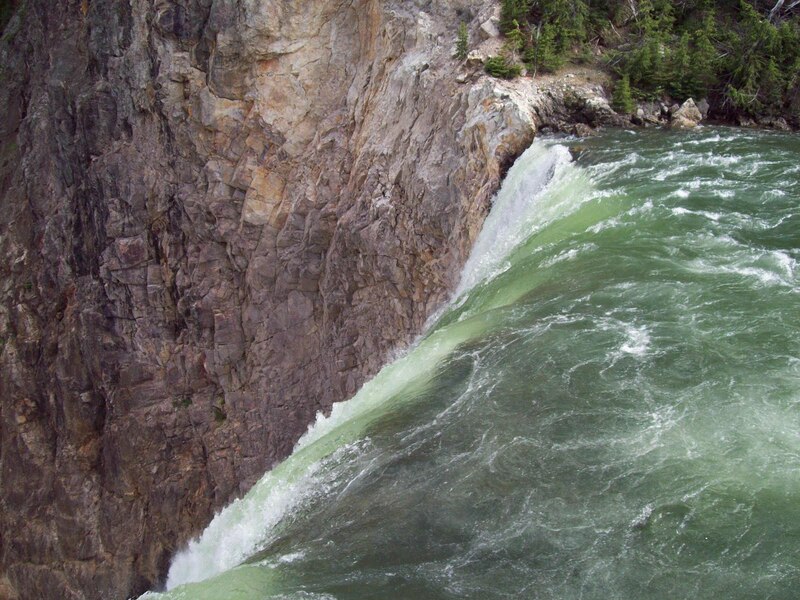 The Law of Mother Earth, now agreed by politicians and grassroots social groups, redefines the country's rich mineral deposits as "blessings" and is expected to lead to radical new conservation and social measures to reduce pollution and control industry. 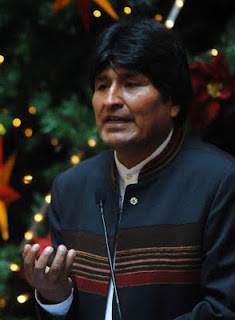 The law, which is part of a complete restructuring of the Bolivian legal system following a change of constitution in 2009, has been heavily influenced by a resurgent indigenous Andean spiritual world view which places the environment and the earth deity known as the Pachamama at the centre of all life. Humans are considered equal to all other entities." When we hear the word yoga, what comes to mind for some of us (particularly those of us in the West) might be a type of exercise that involves contortionistic postures geared toward improving health, well being, flexibility and strength. To limit our understanding of yoga to these postures, or asanas, is not only a gross misconception but also a great oversimplification of what Georg Feuerstein in The Yoga Tradition describes as an "enormous body of spiritual values, attitudes, precepts, and techniques that have been developed in India over at least five millennia and that may be regarded as the very foundation of the ancient Indian civilization. "(1) Even if we add to our understanding of this equation the somewhat lesser known practice of pranayama, the regulation of vital energy through the breath, we have still only skimmed the surface, despite having multiplied our depth a hundred-fold. 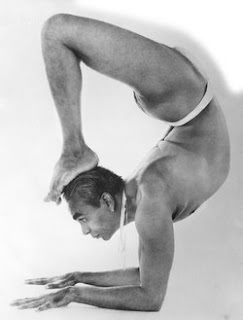 BKS Iyengar practicing hatha yoga 'scorpion' posture (Vrschikasana). 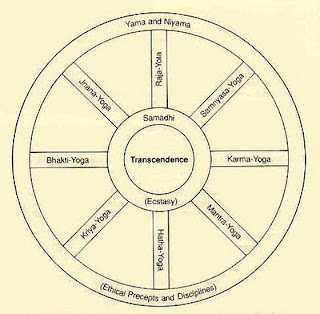 In addition to the systems of yoga found within Feuerstein's wheel, there are numerous others, both ancient and more recent, which are also called Yoga. These include not only traditions that have been influenced and inspired from the yoga of India, like Vajrayana Buddhism (Tibetan Yoga), Zen (Japanese Yoga) and Ch'an (Chinese Yoga), but also Laya Yoga(16), Tantra Yoga (from which Hatha Yoga comes(17)) and Integral (purna) Yoga, for example. These additional yogic approaches are sometimes classified within the confines of the systems represented by Feuerstein's eight spoked wheel, and sometimes not. Integral Yoga,(18) is a more recent evolution and is a good example of how the tradition of yoga has evolved through the ages. Introduced by Shri Aurobindo during his lifetime (1872-1950), it both honors its ancient roots, traditions, values and practices, while simultaneously acknowledging and addressing the vast differences of a modern, westernized world. In this system, Aurobindo responds to what he saw as a characteristic rejection of the material world. This "recoil from matter," he believed, began about 2500 years ago with the introduction of Buddhism and the concept of a "great chain of Karma," which extended the much older Vedantic concept of maya -- the idea that the manifest, material world is an illusion, unreal and inferior. Feuerstein describes Aurobindo's Integral Yoga as "an evolution-based ethics of world affirmation" with "the explicit purpose of bringing the 'divine consciousness' down into the human body-mind and into human life. "(19) At any rate, I think it becomes clear not only how vast and varied Yoga is, but also that it has continued to transform and evolve over time. Most of us are likely to meet yoga in the form of a 'yoga class,' which introduces us to Yoga through its physical expression of postures and breathing techniques. These belong to the realm of Hatha Yoga,(20) which is practiced within many of the yoga systems (Raja, Laya and Tantra Yogas, for example). This physical practice is characterized by not only asanas and pranayama, but also most often include meditation and mantra (chanting). There is also a strong chance that this first class will be a form of Hatha Yoga that is rooted in Patanjali's Classical, or Raja Yoga, as expressed and defined in his Yogasutras. Around 200 CE (about the same time Buddhism and Jainism were spreading), Patanjali gathered together and systematized many of the yogic practices that had been taught and handed down from teacher to student experientially for well over a thousand years. It is not certain whether "Patanjali" is in fact a singular person or a group of people. What is sure is that The Yogasutras, sometimes referred to as Yoga's "bible," is a major reference and resource for yoga today. The Yogasutras is comprised of 196 sutras, or "threads." These are cryptic phrases indicate and give language to the guideposts and landmarks of the sadhaka's (practitioner's) journey into his own consciousness, beyond the ego-based sense of "self" into a greater transcendental "Self," and beyond even that to a thoroughly transcendental state. 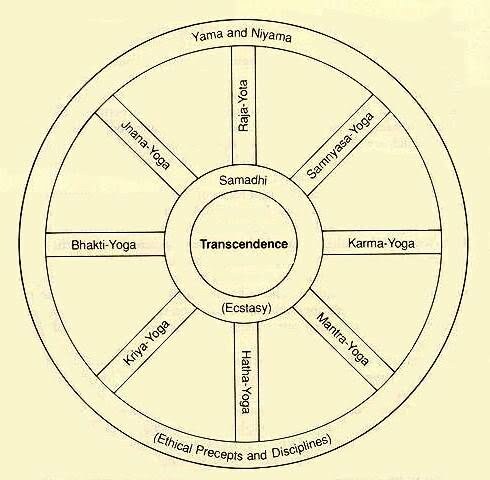 The Yogasutras map out the terrain of consciousness as per Patanjali's version of this practical philosophy. This is not the only map available. It is also worth noting that "the map is not the terrain." Yoga is a philosophy that is not only practiced, but lived with each breath, each thought, each action and word. As much as it is not just a physical practice, it is also not simply a theoretical or intellectual philosophy. It is often expressed through religious language and is rich in its esoteric layers, but I believe it would be better today to say that it is a "practical philosophy" more than a "religion," and more "a way of life" than a practical philosophy. One might go so far as to call it a 'living philosophy' not only because it is studied and understood through the process of living it, but also because it is itself still growing and evolving. Whatever route we take toward the heart of Yoga, if one's practice does not respect the yamas and niyamas, the ethical foundations of yoga, we have not even begun a yogic practice. If that practice does not honor the spiritual, transformative and transcendental goals of yoga, it has veered off in another direction and whatever interesting and useful terrain it may cover, it cannot be called Yoga. 7-Samadhi literally means 'placing, putting together.' (The Yoga Tradition, p.3). Samadhi is defined as "enstasy" ('standing within oneself.).' (Dancing With Siva, p. 805). This is most often seen translated as "absorption" or "ecstasy." 8-This would be Karma Yoga. 20-They come with names like Sivananda Yoga, Iyengar Yoga, Integral Yoga, Vinyasa Yoga, Ashtanga Yoga, Anasura Yoga, Bikram Yoga, etc. but all are physical practices centered around asana, pranayama, mantra, meditation and are all forms of the larger, general system of Hatha Yoga. 21-Not to be confused with the Hatha Yoga form called Ashtanga Vinyasa Yoga, formulated by Pattabhi Jois. 24-I find it interesting to note that each of these yamas could be viewed today as a proper use and exchange of energy. 25-Perhaps the niyamas could be viewed today as the quality of energy, though this is sometimes attributed to dharma. Anne Teresa De Keersmaeker, Come Out, photo by Hofesh Shechter. In 1982 the Dance Committee of the ITI founded International Dance Day to be celebrated every year on 29 April, the anniversary of Jean-Georges Noverre (1727-1810), the creator of modern ballet. The intention of the International Dance Day Message is to celebrate Dance, to revel in this art form, to cross political, cultural and ethnic barriers and bring people together through Dance. Every year a message from an outstanding choreographer or dancer is circulated throughout the world. This year the message will be written Anne Teresa De Keersmaeker. 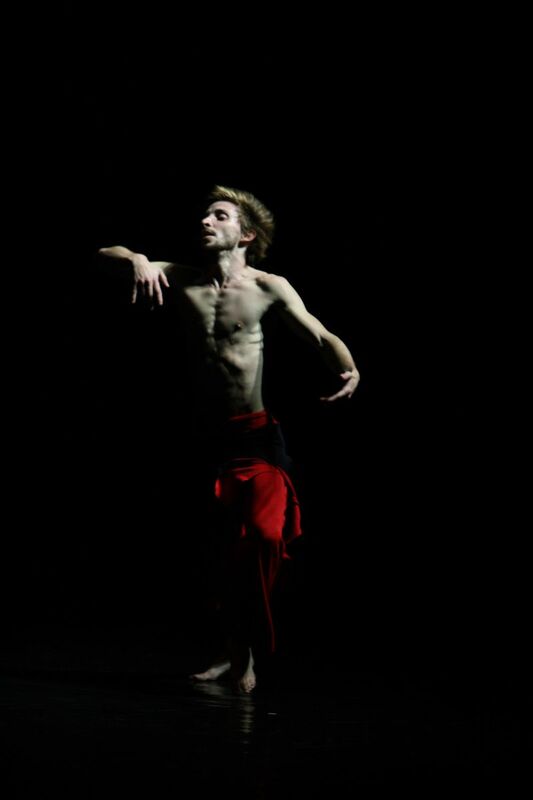 - An excerpt from Thierry De Mey’s film “Rosas danst Rosas"
You have to descend, down into the basement, to find the dancers who come from all over the world to perform at L'Espace Culturel Bertin Poirée in the center of Paris. It is a small and very intimate space, with its old stone walls and archways, and the curved ceiling not so high above. It is in this charming space the Tenri Franco-Japanese Cultural Association produces an ongoing dance series. It is also a space in which you can see every detail of the performer at work. The 'expressive' dancers tended to be actively and consciously performing, committed to conveying both the visceral and emotional experience of the work. The 'pure movers' embodied the movement rather than any overt intent, and allowed their dance, itself, to create our experience as viewers. I would say that the first group were filled with passion, that might remind us of our own. The second group expressed simple and exquisite beauty in their being and their dance. As lovely as these performers were, it was actually the third group, comprised of Sharoni Stern Siegel and Margherita Tisato, that touched me most deeply. These two women were so fully present in themselves in the work that I found my world suspended as I journeyed with them into theirs. Their commitment to the moment managed to brush aside the questioning my mind is prone to (of meaning, content, form, construction, value...), and brought me back to the simple and undeniable reality of existence, where judgement has no role. The cast was completed by Kan Katsura, Victoria Macarte, Vangeline and Vangeline Theater dancers Pamela Herron, Maki Shinagawa, Azumi Me and Stacy Lynn Smith. Music and sound effects were by Noriko Tomatani and Francois Tariq. The small array of lights managed to create a multitude of effects and moods, thanks to Margot Olliveaux, the center's inhouse lighting designer. Walk Gently... © Ann Moradian. All rights reserved. with feet that listen tenderly. It is my body you mark with each step. as it breathes through the pores of your skin. in your lungs in your blood in your heart. it is the dust of my skin you spit aside. And when the rains fall, take care. My muddy checks distort and slide. with a joy that veers toward ecstasy. Come often, lest paths carved out overs years disappear. Life shoots up any place it can. Certain small deaths are necessary. But walk gently, with feet that listen tenderly and give you strength. It is my body that supports you as you mark it with each step. where the wind blows unhindered. The Mine © Ann Moradian. All rights reserved. Ahimsa : When Will it Work? I have always wondered why non-violent protest worked so well in India with the British and has not yet succeeded in China with the Tibetans. It seems clear to me, finally, and probably should have been obvious all along! This personal epiphany of understanding was sparked on reading the Dalai Lama's statement in honor of the 52nd anniversary of the Tibetan National Uprising Day this morning, and so I share it with you, here. What is "PranaStretch"? What is "Prana/Pas Seul"? Prana, meaning "vital energy," is most readily accessed through the breath. Prana and thought flow together. PranaStretch is a yoga-based practice that brings the breath and attention together in the moving body. Riding on the breath, our awareness combs through the inner body, releasing blockages, developing optimal alignment, and an ease, joy and power in moving in the world. This process releases tension which, in turn, opens us to our full range of motion, flexibility and articulation, and enables us to deepen our access to the body's core energy, its strength, wisdom and honest expression. The class is non-competitive and deeply strengthening: an intense yet profoundly relaxing practice. Moving from the solid foundations of PranaStretch, Soul: pas seul is a physical exploration of relationship: one's relationship with one's environment, one's relation to another being, and one's relationship to many others. Whether in physical contact or not, the work challenges the depth, awareness and honesty of our relationships, as well as awakening us to our interdependence in the world. "Pas Seul" can be translated as 'not alone' as well as 'a single step.' Perhaps we could describe the work as an exploration of the energetics of partnering. It is for anyone, and everyone. We work from where we are and move forward together from there. This work, developed by Ann Moradian, is originally based on the work of Eric BEELER who, during his life, taught "American Yoga" to professional dancers in New York. In addition to its yogic base and foundational links with Alexander, Pilates and Niklaus Techniques, PranaStretch and Soul: pas seul also incorporate elements from the martial arts, kinesiology and dance. It is, in essence, the dance of each breath as it journeys profoundly inward and flows out again extending that (which is us in that moment) beyond our bodies, out into the world and toward each other. YELLOWSTONE © Ann Moradian. All rights reserved. carving valleys into the roots of the rising peaks. smelling the life above that calls in thirst. and belch muddy sulphur in relief. the birthing ground of mountains. photos copyright 2010, Kenneth L. Tharp. I wanted to share these photos my father took. The terrain is distinctive and fascinating, though harsh. I tried to put words to the memory of that land -- not quite a poem, but maybe an idea shared.